Edwards snapped a 49-race winless skid for his first victory since joining Joe Gibbs. Carl Edwards took the lead with 18 laps to go deciding to take a late pit stop and made it over 60 laps on his last tank of gas. Edwards, Greg Biffle and Dale Earnhardt Jr. finished 1-2-3 by making their gas last for the final 60 laps. Edwards becomes the ninth different driver to win a race in 2015. 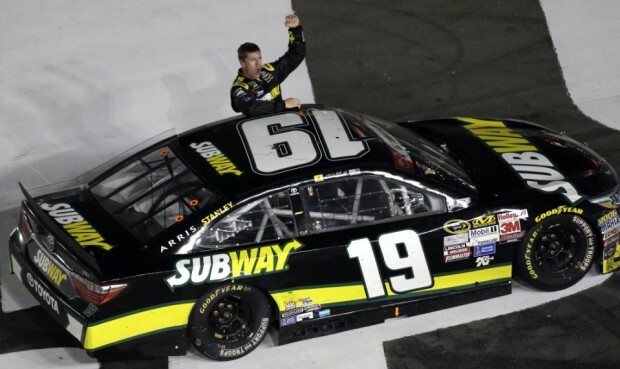 The win gave JGR a Charlotte sweep, Denny Hamlin won the All-Star Race on May 16. On lap 88, Jimmie Johnson lost control of his car and spun out in Turn 4. He didn’t have any damage, but lost track position and had to restart 31st. “We have nothing to lose so we’re trying to be as aggressive as we can on pit calls and strategy,” Johnson said while his team repaired his car in the garage. NASCAR moves next to Delaware for the Fedex 400 Benefiting Autism Speaks on Sunday, May 31.